The QRM Institute Training & Certification Program is the only internationally recognized QRM program, that has been specifically designed by combining the practitioner experience from the member organizations. We offer four levels of QRM training and certification. After being completed successfully, these training courses lead to an official certified degree by the QRM Institute. After the completion of this course you will understand the four core concepts of QRM, become familiar with the implementation road map and act as a local QRM ambassador at operational level. This training program is aimed at students in educational institutions and the operational staff within enterprises. The QRM Institute Silver course allows you to support a QRM-implementation project. After the course, the participants will be able to perform a full QRM-analysis and start a project under the guidance of an internal QRM Institute Gold graduate or external QRM consultant. The participants will acquire the basic implementation, change management skills and play an active role in organizing a QRM Cell. 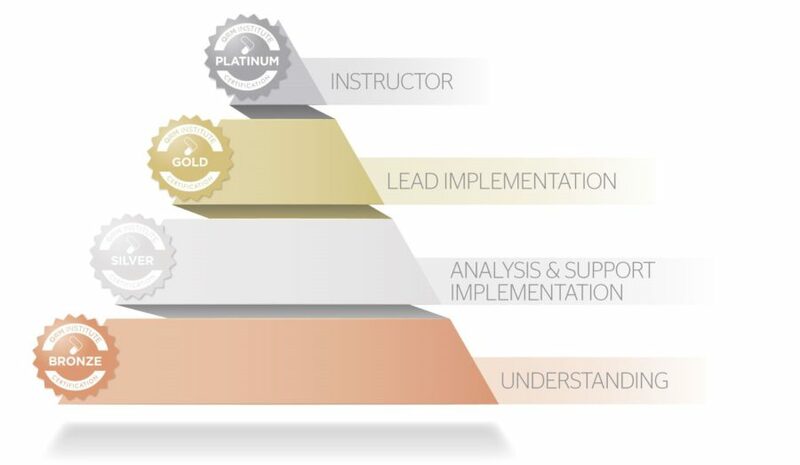 The QRM Institute Gold course enables you to lead a successful QRM-implementation project and achieve a significant lead time reduction. The participants will be able to execute company-wide QRM-implementations, perform basic training for colleagues, develop a team mindset and drive change management at leadership level. The training is mainly done through individual coaching during an actual QRM-implementation. The QRM Institute Platinum course is intended for people who aspire to become a QRM instructor. The QRM Institute Platinum participant will be equipped to inspire, instruct and coach their trainees. The training is mainly done through individual coaching and several retreats aimed at perfecting their skill set. passed the theory exam with a sufficient score. The final examination consists of both a written theory exam and a practical assignment, in which you demonstrate how you are able to apply the theory in your own practice. you will develop a critical view on how to carry out improvements.